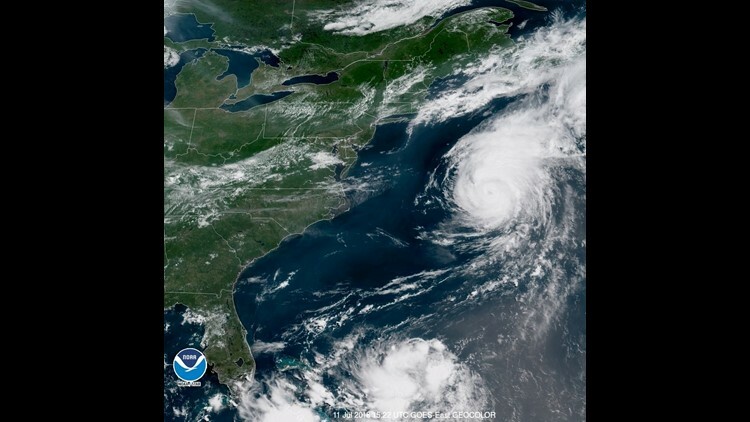 Hurricane Chris (right) continues to spin out to sea on Wednesday, July 11, 2018. Hurricane Chris continued to race out into the Atlantic Ocean on Wednesday. Other than some rough seas along the East Coast, it poses no threat to the USA, the National Hurricane Center said. The storm could clip Newfoundland, Canada, late Thursday, dumping up to 6 inches of rain and causing flash flooding. As of 5 p.m. EDT, Chris had winds of 90 mph and was moving to the northeast at 25 mph. It was about 570 miles east-northeast of Cape Hatteras, North Carolina. Swells generated by Hurricane Chris are expected to affect portions of the coasts of North Carolina and the mid-Atlantic states during the next few days, the hurricane center warned. "These swells could cause life-threatening surf and rip current conditions." Rip currents are possible for beaches from Maine to the Carolinas, the National Weather Service said. At least 15 people have drowned in the USA because of rip currents in 2018, the weather service reported. The Canadian Hurricane Centre said southeastern Newfoundland is the most likely to deal with direct impacts from the storm. The forecast calls for Chris making landfall or passing just south of the Avalon Peninsula as a strong post-tropical storm Thursday evening. The area could be hit by heavy rain, strong winds and waves with storm surge along parts of the coast, the centre said. Chris is the second hurricane of the 2018 Atlantic hurricane season, after Beryl. It's unusually early for a second hurricane to form: On average, that does not occur until later in the summer, around Aug. 28, according to the hurricane center. Beryl coming back to life? The remnants of what was Hurricane Beryl could reorganize off the East Coast by the weekend. The hurricane center gives the storm a 50 percent chance of regenerating into a tropical depression or storm within the next five days. If it does reform, it should stay well off the U.S. East Coast, AccuWeather said. Beryl is not expected to track close enough to the U.S. coast to bring significant rain or wind, AccuWeather hurricane expert Dan Kottlowski said. It may pass close enough to Bermuda to bring periods of rain, gusty winds and rough surf over the weekend. Just like Chris, rough seas from Beryl would lead to dangerous beach conditions along the East Coast by the weekend.